I’m speaking to my grandmother–she’s in Las Vegas, and I’m in Los Angeles. It could be any Friday afternoon in her 94th year. “Have you published anything lately?” Grandma asks. I say, “Sure,” unwilling to elaborate. But she needles me for more. Each time Grandma says those six words, my stomach lurches. There came a time in this writer’s life when publishing an article or short story lost its novelty. Yes, it’s nice–to have my ideas out there in the world, to get a paycheck, to engage with a few more readers I haven’t yet reached–but eventually it happened often enough that it doesn’t make my week or even my day. While weeks can pass, and my name appears on not one byline, at other times, I have three pieces published in a single week. When I reached that professional landmark, keeping up with all my work–and making sure Grandma got to see it–became challenging. Many of the pieces were online, and Grandma was not. I would have to print my article, then mail it to her. Other pieces appeared in print magazines. I would have to copy them–one time I got hassled at the copy shop because they didn’t believe I was copying my own work–and then mail them. I needed stamps, and the right size envelopes, and it was tiresome on top of my writing and invoicing and parenting and housekeeping schedule. I also hated the fuss. You know how your grandmother tells you, “You’re gorgeous!” even when zits cover your face, your new glasses are ugly, and you recently got an impulse haircut you now regret? That’s how I felt about my grandma’s comments regarding my writing. Nothing about them would be true. Why put myself in a position to suffer through them? Always a pack rat, it astonished me how much of Grandma’s “stuff” was associated with writing. She saved the letters her cousins and her sweetheart wrote her during WWII, every card I sent her, shelves and shelves of books she hadn’t read for years. She saved all her own writing from her teens on: picture book manuscripts, diaries, short stories, opinion pieces, poems. Few of these were ever published outside of synagogue sisterhood newsletters and the occasional letter to the editor. When I moved away, Grandma begged me to write her. And she wrote me: long letters, with envelopes stuffed with newspaper clippings she thought would interest me. Grandma also loved to talk–so much so that my sister once bought Grandma a little telephone charm for her charm bracelet. If we didn’t phone often enough, Grandma would call us. Although my initial reaction to her guilt trips was annoyance–yes, the classic, “Why don’t you call?” escaped her lips more than once–it was also amusing how our neglect turned her into a cliché. Early in my marriage, when I learned about Gary Chapman’s Five Love Languages, I instantly recognized Grandma’s love language was “Words of Affirmation.” It was then when I realized that our words made Grandma feel loved, connected. Near the end of Grandma’s 95th year, she started to mix up names and dates and to trail off without finishing a story. Her conversation became wandering, repetitive. She could no longer decode some fonts and following the thread of a plot became more and more challenging. And all that writing she loved to do? She could hardly finish a personal letter. When dementia ruined her conversational ability, letter writing skills, and reading ability, it left Grandma feeling lonely. She was stranded on an island without words. Since Grandma’s death, even shortly before it, I have found myself writing about her, over and over. I’ve written about her drive, her intelligence, her beauty, and her great love for me. I’ve recalled some of the quirky stories she told me and shared them with the world. Is Grandma sending me these essays and stories and articles from her place in the Next World? Is she sending me messages about her life that she never got to publish herself? Is she slipping a little money into my pocket–as grandparents are wont to do–by helping me sell stories? 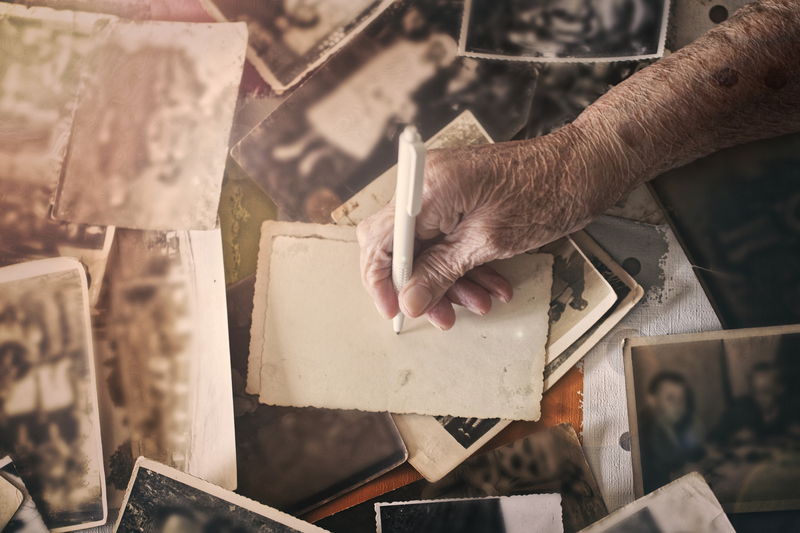 But I can tell you this: the flood of words these past months keeps me connected to Grandma as surely as one of her long letters.